Ever wanted to read top news from your favorite newspaper, or articles from website. But you find it annoying to click and wait till the page opens get a glimpse of the news? Try RSS readers. 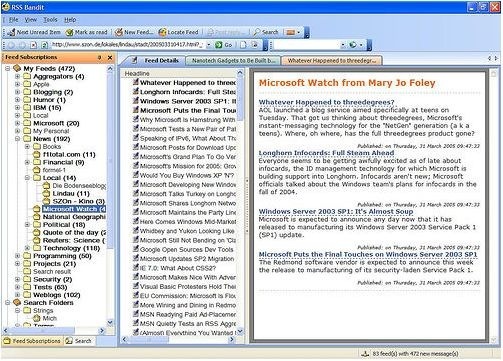 RSS readers download the current updates and let you get the glimpse of the article without going to the page. If you want to read it in detail, you can simply click the link. I have tried many RSS readers but I find RSS Bandit as the best. The best thing about it is that I can synchronize my Google Reader with the news I read in RSS bandit. If you want to have a feel of a newspaper, you can change its appearance. 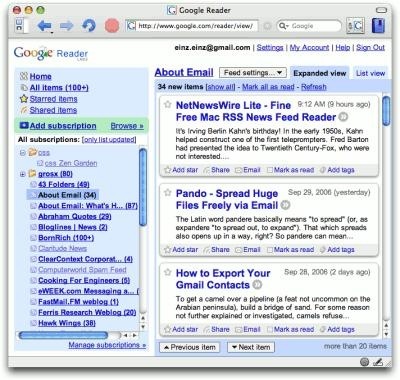 If you like online RSS reader with offline mode, try Google Reader. I find it very useful and easy to use. In case you want to use offline feature, you need to install Google Gears. ~ by Kush on January 27, 2009. On this page you will find some exciting softwares which are absolutely free. These have been categorized as per the features. This page has only limited number of softwares which I have either tried or come across while trying to find the best in its category. You are welcome to post your comments and views. If you come across some better softwares please do leave a comment or mail me at contact@freesoftwares.tk and I will update the list.